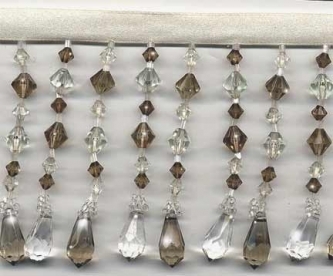 From our Teardrops Collection: This is an exceptionally rich and elegant beaded fringe trim in translucent crystal clear and the palest of taupe faceted teardrops. Bicone beads in crystal clear and medium taupe, with glistening accents of crystal clear seed beads and bugle beads. Exceptional detail and craftsmanship. High quality and crystal clear acrylic beads. Each beaded strand is 3" long, including the 3/8" ivory satin ribbon. Even bottom.